"This is a rich and sweet yet surprisingly simple soup that is wonderful served hot with crusty bread or cold with a dollop of sour cream." 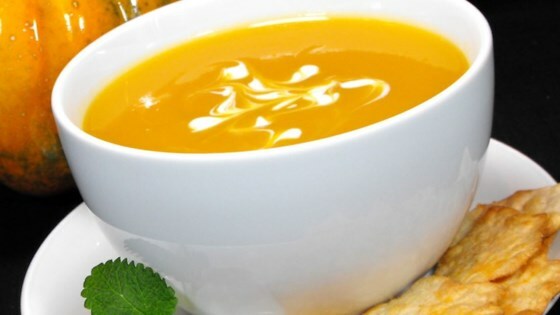 Showcase the delicious flavors of squash in this creamy, low-fat soup. Oh, this was good. Really easy, too! As another person recommended, I cut the sugar and the cream cheese approximately in half. It is very rich. I made this for a Thanksgiving party and received great compliments. Even people who said they don't like soup complimented this. I look forward to making it again.